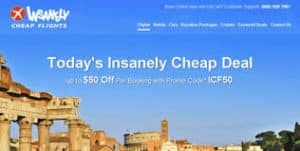 How would you rate your experience with Insanely Cheap Flights ? Steve Oliverez founded InsanelyCheapFlights.com in 2009. The company does business under the name DealLookUp and offers substantial savings on airline tickets, vacation packages, hotel rooms, and rental cars. In 2013, the company announced that it had an increase in traffic of more than 1200% in the prior 12 months, with 2.5 million unique visitors in the second quarter of 2013, up from 1.5 million in the first quarter. CEO Steve Oliverez also published a book in 2017 entitled The Book on Making Money. Company headquarters are currently located in Rollingwood, Virginia, although the CEO has stated that he is considering moving to Texas, although no date or city has been indicated. Question 1: What is the phone number for Insanely Cheap Flights? Answer 1: The phone number for Insanely Cheap Flights is (703) 401-0292. Question 2: Who is the CEO of Insanely Cheap Flights? Answer 2: The CEO of Insanely Cheap Flights is Steve Oliverez. Question 3: Who founded Insanely Cheap Flights? Answer 3: Insanely Cheap Flights was founded by Steve Oliverez in 2006. Want to make sure Insanely Cheap Flights sees your comment or complaint?